Are you Ready to make SIMPLE changes to Reduce Your Stress and Increase Your Enjoyment for this Holiday Season? Join me in this 4-week Teleclass for only $49! Sign-up to attend a Free Introductory Teleclass! 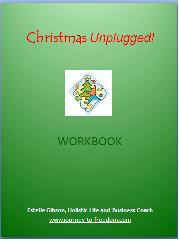 Many years ago, I attended an “Unplug the Christmas Machine” workshop, based on a popular book at that time. 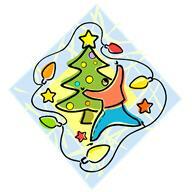 It was a time in my life when I had just ended a relationship and was dreading going into another holiday season…. all alone. After taking the workshop, I created what I’ll have to say was one of my most memorable holiday seasons ever! Instead of having a pity party about being alone and what was missing in my life…. One of the big realizations that I had during the workshop was that for many years I had been trying to recreate the holidays encompassing all of the activities and traditions that my family, a family of 7 did, and I was trying to do them all by myself!!! I had spent many holidays, baking dozens of cookies, throwing parties, attending holiday concerts and services, shopping for the perfect gifts for everyone, wrapping the perfect packages-overcompensating, overspending and overindulging. One of the great things about the holidays growing up was how much fun we had working together on wrapping gifts, singing songs, baking cookies…it was truly a family celebration. So I decided to bring back many of the holiday traditions from years gone by that I had always loved and I also created new traditions that fit with my current lifestyle. I shared many of those traditions with friends and loved ones. All in all it was an incredibly meaningful and joyous holiday. So, at this time of year when it’s easy to become externally focused and to get swept up in the ”machine“ that Christmas has become, I hope that this class will inspire and support you to consciously create a holiday season that is meaningful to you and celebrated in a way that fits You and Your lifestyle. In this 4-week teleclass, you will learn Universal Truth Principals, use the Law of Attraction and Accelerated Learning Practices, and take concrete action steps to help YOU BREAK FREE from limiting beliefs and Consciously Create Your Holiday! Class One: What do I desire? In this class you will learn how to use the Law of Attraction and guided imagery to consciously create the holiday you desire. Two: Where Am I now? In this class you will examine your traditions: family and childhood traditions, holiday preparations, spending patterns, etc and begin to make conscious choices about what you plan for this holiday season. Class Three: What stops me? In this class you learn how to use the Law of Deliberate Creation and the Law of Allowing to align your thoughts, beliefs and behaviors with what you desire for the holidays. Class Four: How do I get there? In this class you will combine all your learning and insights from Class 1-3, into a workable plan: Set specific goals and objectives, create a holiday spending plan, self-care plan and reassess your thoughts about the season. This introductory teleclass is free and provides an overview of the 4-week teleclass.